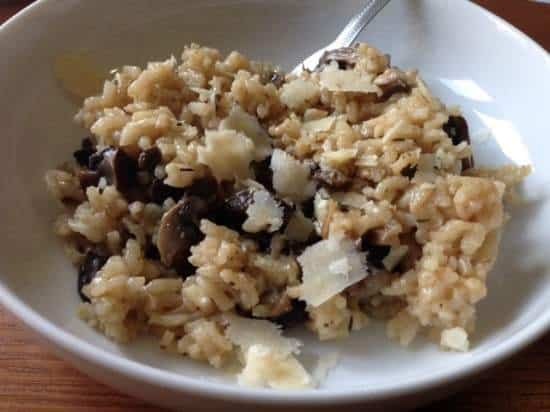 Risotto is one of my favourite meals but I can never be bothered with the faff of making it – all that stirring and gradually adding stock makes me not want to cook it as often as I’d like to eat it! So you can imagine how pleased I was when I discovered a few months ago that my trusty slow cooker could do most of the work for me! I know, I’m easily pleased aren’t I? I’ve been making risotto in the slow cooker now for a couple of months and all of the variations that I’ve tried have been delicious. 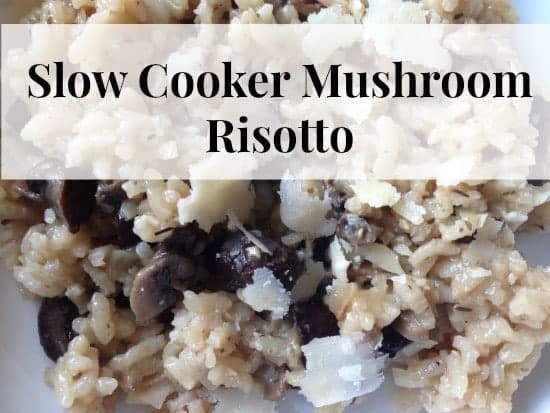 I’m going to share my version of slow cooker mushroom risotto today but you can make your own variations really easily. Apart from the stock and the rice, the quantities of the rest of the ingredients aren’t set in stone as I usually just use what I have in. Today I bought some ready chopped onion reduced to 9p and a 2 packs of mushrooms already chopped down to 20p each so I just used them. Fry the onions and the garlic in the butter gently until the onions are softened. Add in the rice and fry for 2-3 minutes stirring continuously so the rice doesn’t stick to the pan – don’t panic though this is the hardest part of the recipe! Add the rice and onion mix to the slow cooker and pour over a pint and a three quarters of the stock. Stir in mushrooms and cook on low for around an hour and a half to two hours. When you think it’s done, try a little bit and see what you think. If it’s ready then pour in just enough of the stock you have left to loosen it up a little and then add in any parmesan cheese you would like to add. Turn the slow cooker off, pop the lid back on and leave it for five minutes before serving and garnishing with a shaving of parmesan cheese. Tastes gorgeous for just a fraction of the effort! 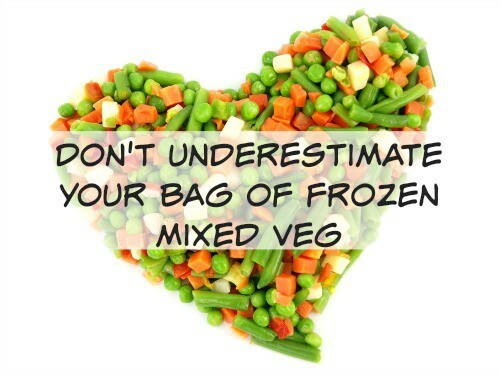 Don’t underestimate your bag of frozen mixed veg….